I knew I wanted to cloth diaper before my baby was born. My mother had cloth diapered with a diaper service and she encouraged me to do the same. One of my best friends cloth diapers her baby and she was a great resource and encourager for my decision. However, once my daughter was born it was a whirlwind of poop, sleepless nights, and reflux issues and so cloth diapering fell by the wayside. My husband returned from a deployment when our daughter was about 3 months old and I finally had the extra help I needed to tackle my fear of cloth diapering. Unfortunately, the apartment that I was renting at the time did not allow tenants to have their own washer and dryer. So my options were the laundromat down the block, a shared coin washer in the basement of the building, or my bath tub. One of the reasons my husband and I chose to cloth diaper was to save money and using a laundromat or coin washer would completely defeat that purpose so I chose my bath tub. I remember the first day I ran out of disposables and felt totally committed to cloth diapering, I was overwhelmed and daunted by the task. By the end of that day I realized my fears were unfounded and cloth diapering was no more difficult than disposables and I didn't have any poosplosions (my term for the poop seepage that covered my daughter's onesies on a regular basis). I started with gDiapers and used cotton prefolds as inserts because I knew they would be easiest to wash. I reused the cover whenever possible and rinsed the plastic liner before washing it with some detergent I put in a squirt bottle next to my bathroom sink. The prefold went into a small bucket that sat in my bathtub and I sprinkled baking soda in to it to keep it from smelling. Every other night I would fill the bucket with water and diaper detergent and let them soak for a few hours then I hand washed and rinsed them like any other clothing item. Once a month I put all the prefolds into a coin washer with a little bleach to make sure they were getting thoroughly cleaned. When it was warm and sunny outside I line dried them on my porch and when it was cold I put them on a drying rack near a window. I eventually added bumGenius, Rumparooz and GroVia diapers to my diaper laundry routine and cloth diapered without a washing machine for about six months before moving to an apartment with a washer/dryer hookup. My daughter rarely got rashes and never again had a poosplosion while wearing a cloth diaper. 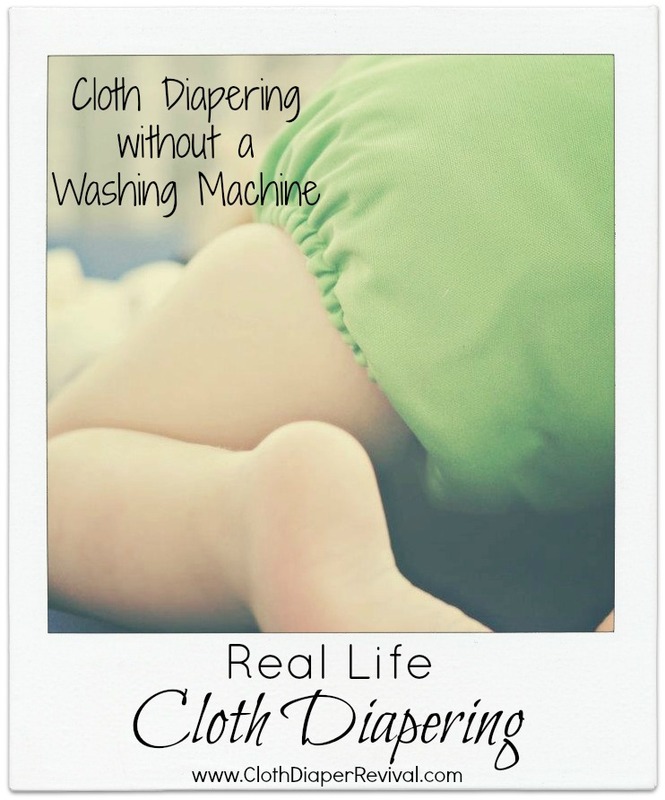 Have you cloth diapered without access to a washing machine? What tips do you have? Indya has a 14 month old daughter that she has been cloth diapering for a year. She is also a Coast Guard wife and writes about her experiences as a mother, military wife, and renter over at www.coastie-wifey-lifey.blogspot.com. I'm so glad I could share my experience. I hope that it encourages someone else out there! This is awesome! We cloth diapered with our son for two years, and this will be the first time we will do cloth without unlimited access to laundry. Our daughter will come in July, and we are wanting to avoid the laundry room usage more than we do already. Thank you so much for sharing, it has definitely given me some ideas! We also have a diaper sprayer which hooks up to our toilet and uses the water in the tank. We sprayed our diapers before tossing them in the wet bag and it helped SO much with ammonia and coming clean from a wash. Have you invested in one yet? Best purchase for diapering accessories by far!